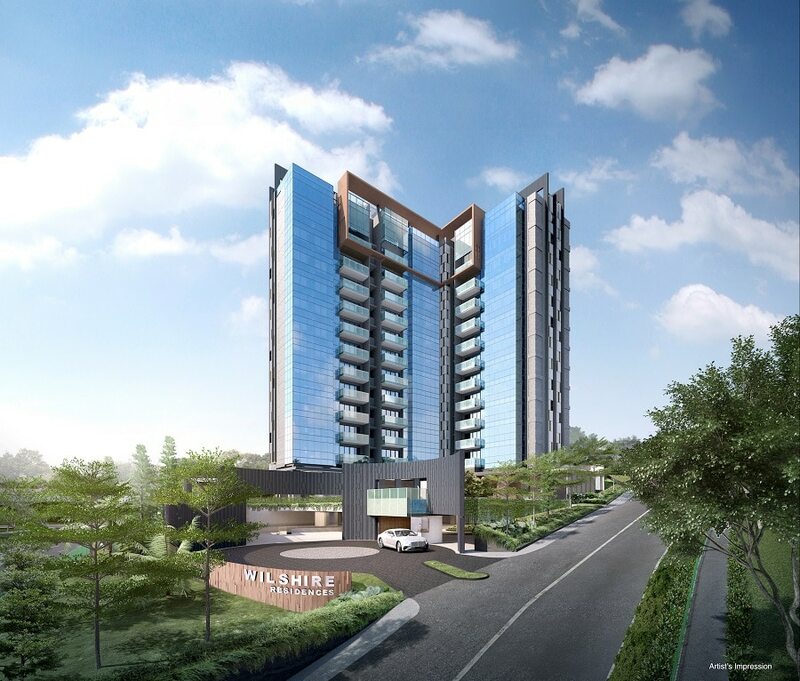 Wilshire Residences is an upcoming residential development that is located along Farrer Road, Core Central Region of the island. It sits in the prime District 10, one of the most exclusive residential enclaves in Singapore. 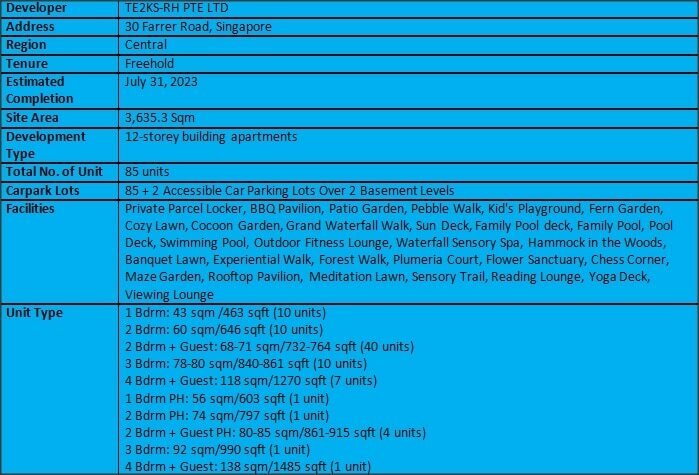 Wilshire Residences is just next to The Levelz and Sutton Place and opposite of Waterfall Gardens which is just opposite of the small Farrer Road. The land parcel of Wilshire Residences previously belonged to The Wilshire, an eight storey apartment bloc which comprises of 20 residential units, built during the 1980s. It was successfully acquired by a joint venture between local listed developer, Roxy-Pacific Holdings Limited’s subsidiary RP Ventures, TE2 Development and also Kim Seng Holdings during a collective sales exercise in January 2018. Wilshire Residences has a total site area of approximately 39,130 square feet and with a gross plot ratio of 1.6. The land tenure of Wilshire Residences belongs to freehold. 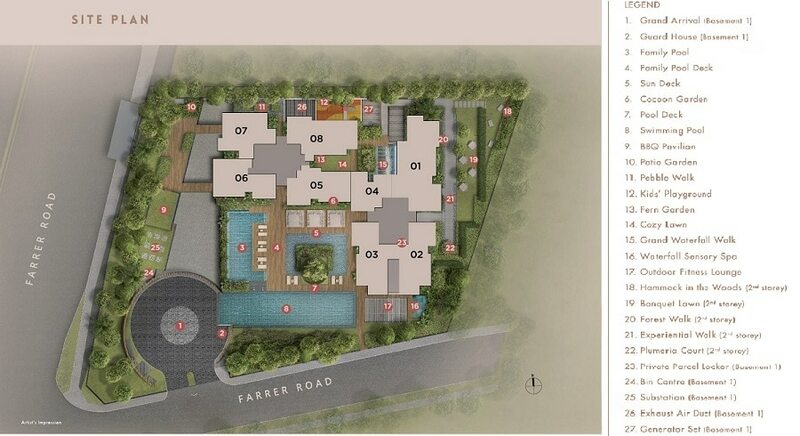 Other developments that are within this project’s vicinity include Leedon Residences, Siena at Farrer, Pollen and Bleu, D’Leedon, Spanish Village, Viz at Holland, The Holland Collection, Sommerville Grandeur, Gallop Gables, Gallop Green, Woollerton Park Apartments and also Victoria Park Villas. 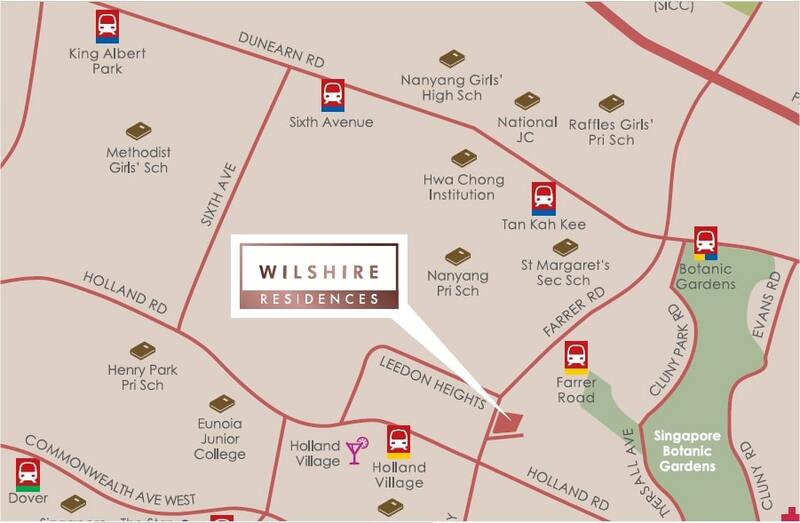 Wilshire Residences is approximately 600 m away from Farrer Road MRT Station. This station will be operating the MRT Circle Line. In future, this MRT line will be able to transport the future residents of Wilshire Residences straight to Keppel MRT Station when it is due to be completed in 2025. As for now, future residents just need to travel 2 stations from Farrer Park MRT Station towards Harbourfront MRT Station to arrive at Buona Vista MRT Interchange Station, where the MRT East West Line is readily available. The Botanic Gardens MRT Interchange Station is also just 1 station away from Farrer Park MRT Station towards Promenade MRT Station direction, where the MRT Downtown Line is readily available. The Bishan MRT Interchange Station, which operates both the MRT Circle Line and also the MRT North South Line is also just 3 stations away from Farrer Road MRT Station. All these provide a comprehensive coverage of MRT networks for its future residents. For drivers, Wilshire Residences is approximately 10 minutes’ drive away from the Orchard Shopping Belt and it is just only approximately 23 minutes’ drive to the Central Business District (CBD). Wilshire Residences is also close to the Pan Island Expressway (PIE) and also the Central Expressway (CTE) which bring conduit of conveniences to drivers. In terms of shopping, dining and leisure amenities, future residents of Wilshire Residences just need to head down to Holland Village which is just 1 MRT station away. At Holland Village, they will be able to find a wide variety retail shops, F&B outlets, a supermarket as well as a wet market and food centre where daily necessities, fresh market produce and dining needs can be easily fulfilled. Wilshire Residences is also close to other shopping malls such as Buona Vista Xchange, The Star Vista and Rochester Mall. Other nearby food centres includes Blk 7 Empress Road Market and Food Centre, Commonwealth Crescent Market, Blk 44 Holland Drive Market and Food Centre, Tanglin Halt Market and Adam Food Centre. For families with school going children, Wilshire Residences is close to Nanyang Primary School, CHIJ (Kellock) Primary School, New Town Primary School, Queenstown Primary School, Raffles Girls’ Primary School, Saint Margaret’s Secondary School, Hwa Chong Institution, Queensway Secondary School, Nanyang Girls’ High School and National Junior College. Serenity – Wilshire Residences is located in the quiet private residential enclave. Prime – It is located in the prime District 10. Locality – It is just walking distance to Farrer Road MRT Station. Reputable Developers – It is developed by Roxy-Pacific Holdings. Want to be a proud owner of a unit in Wilshire Residences? Thank you for your interest in Wilshire Residences!